BT Wi-fi has the UK's largest wi-fi network with millions of hotspots at hotels, coffee shops, train stations, airports, homes and more. Download and upload as much as you like. No 3G limits and bills. Easy-to-use and no contract. Regular wi-fi user? You could save money with a subscription. 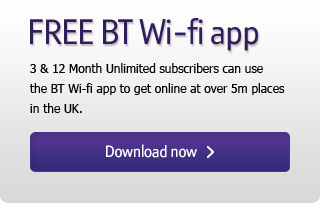 Currency conversion: You are buying access to the BT Wi-fi service in GBP sterling. BT isn't responsible for any conversion rate charges or fees that your card issuer asks you to pay. Early termination charges apply to regular access products.